Imagine my excitement when I saw the Google blog post about a new Street View adventure that took you inside of a volcano. I’ve always wanted to jump inside of a volcano! Then can you imagine my disappointment when I learned that the new Volcano View only lets you peer into the lava from the safety of the volcano’s rim. Very intense disappointment! So so so close to touching the inside of a volcano. This is where the fun basically stops. Try going closer to the sweet, hot, bubbling lava, and Google Street View forces you safely to the side. As hungry as you may be to see what lava looks like when it’s sizzling right up next to your eyeballs, you’re out of luck with this interactive adventure. Ugh, look at those fun-looking fire waves! Perhaps I could try another route down into the bowels of the Earth to figuratively dip my toes into the candy-colored magma. But alas, Google Maps won’t let you. I thought I might be able to do this lava-dip like a high dive but no such luck. It’s cool to see a volcano while you’re sitting in your underwear at home, I guess. And I guess it would be kind of tough for Google to get a camera close enough to molten rock to get the right shot for Street View without the camera melting. That company has, like, hundreds of billions of dollars and wants to cure cancer, though. Seems like they could figure out a simple man’s dream to see what it’s like to jump inside a volcano. It’s no magma bath, but this does look like a nice camping spot. 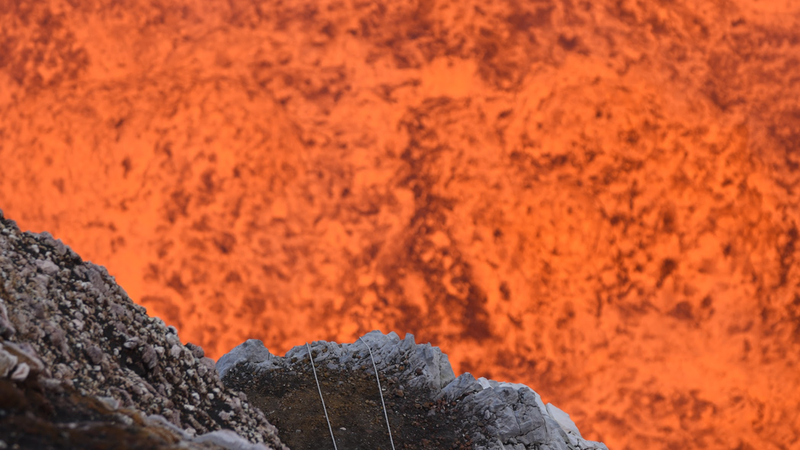 You can explore the volcano in Vanuatu on Google Street View. Hope you have more luck than me taking a dip in that hot, sweaty lava.